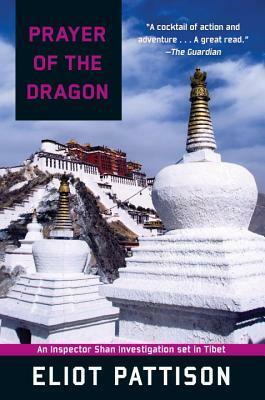 Prayer of the Dragon by Eliot Pattison is intriguing because of the cultural tidbits about Tibet. The main character is a Chinese policeman who has spent time in a Chinese gulag and whose companions now are an old Tibetan monk and another Tibetan from a secret outlawed temple. All three are called to a small Tibetan town after murders have occurred there. The monks are threatened and tortured by the overly zealous town headman, who wants no interference and no upsurge of religion in his territory. The murders are somehow connected to the sacred mountain called the Dragon, and the secrets on the other side. There are miners panning for gold in the mountain and the valleys, and the policeman must find the perpetrators of the crimes or risk being charged himself. Interesting novel, but overly long and drawn out. Had to skip to the end after two-thirds of the way into the book. Read Susan Conant's 18th dog lover's mystery novel, All Shots. 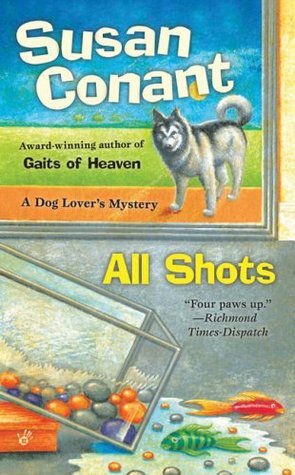 More about her malamute dogs - training them, keeping more than one in the same household, showing them for awards and titles. And making sure everyone knows the difference between a malamute and a Siberian husky. The plot involves identity theft, both human and canine. Set in Cambridge, Mass., the book also describes various Harvard types and their current fads, one of which is maintaining a "Media-free" environment for preschoolers. No TV, no TV cartoon characters on their toys, books, or clothing, etc. Interesting!